Trust is an important factor in risk management, affecting judgements of risk and benefit, technology acceptance and other forms of cooperation. 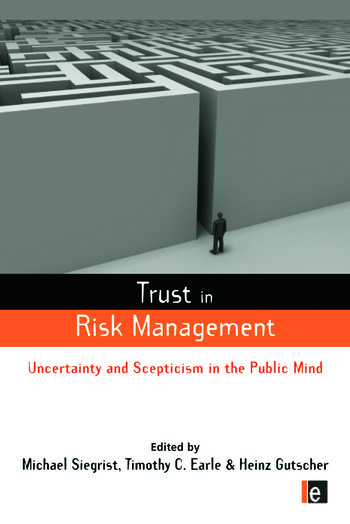 In this book the world's leading risk researchers explore all aspects of trust as it relates to risk management and communication. The authors draw on a wide variety of disciplinary approaches and empirical case studies on topics such as mobile phone technology, well-known food accidents and crises, wetland management, smallpox vaccination, cooperative risk management of US forests and the disposal of the Brent Spar oil drilling platform. The book integrates diverse research traditions and provides new insights into the phenomenon of trust, including the factors that lead to the establishment and erosion of trust. Insightful analyses are provided for researchers and students of environmental and social science and professionals engaged in risk management and communication in both public and private sectors.